In the high octane atmosphere of the Formula One pit lane, the spotlight is most often on the superstar drivers. And yet, without the technical knowledge, competitive determination and outright obsession from his garage of mechanics, no driver could possibly hope to claim a spot on the podium. These are the guys who make every World Champion, and any mistakes can have critical consequences. That's not to say the F1 crew is just a group of highly skilled technical engineers, tweaking machinery in wind tunnels and crunching data through high spec computers. These boys can seriously let their hair down. 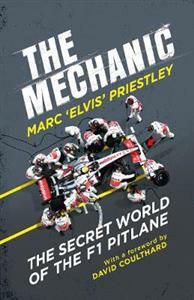 Whether it be parties on luxury yachts in Monaco or elaborate photo opportunities in gravity-defying aeroplanes, this is a world which thrills on and off the track.Join McLaren's former Number One mechanic, Marc 'Elvis' Priestley as he tours the world, revealing some of Formula One's most outrageous secrets and the fiercest rivalries, all fuelled by the determination to win. This is Formula One as you've never seen it before.